The Feast of the Patronage of Mary, the Mother of God, is celebrated on October 1st. This Feast was placed on the Church calendar to commemorate the apparition of the Mother of God in Constantinople in the 10th century. The account of the apparition is found in the life of St. Andrew, the fool for Christ’s sake. The Saracens were trying to take the city of Constantinople and had begun the decisive battle. The terror-stricken people had gathered in the various churches. The event took place at the Church of Balchernae near Constantinople. During the Office of the Vigil, at about 4 o-clock in the morning, St. Andrew and his disciple, Epiphanius, saw a majestic woman supported by St. John the Baptist and St. John the Theologian, accompanied by several saints. 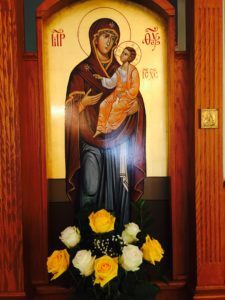 On reaching the center of the Church, the Mother of God knelt down and remained long in prayer, her face bathed in tears. When she prayed again before the Altar, she took the veil that covered her head, holding it above her head, extended it over all the people in the Church., Andrew and Epiphanius alone were able to see the appearance of the Mother of God, but all who were present felt the grace of her protection. The next day the city was freed from danger.